Well, here we are, the first Saturday of the New Year. Just in case ya'll got all panicky and thought Jen's Sketch For You To Try would be "done" at the end of last year, fear no more! In fact she is kicking the New Year off right with her new guest designer, Kirsten DuBosque (ked on SCS). She and I have become friends through designing for My Favorite Things, so I decided to pull out an MFT set to use for my card today! It's called Paper Dolls and features the most precious little girl and she comes with all kinds of outfits to put on her--a very fun set to play with and I plan to use her a lot more! I realize I'm all over the place with my color palette on this one--I just couldn't get it to the right "proportions" (in my book, anyway). Anyway, I've got lots of stamping to do today, as you are in for some real treats with some upcoming releases (you will Luh-huvve them! ), so I will leave this short and sweet. I'll be back soon! Before you get started on your crafting adventure today, check out the other SFYTT girls and prepare to be amazed! : Shannan, Carole, Amy S. and Amy R.
SUSIE Q-TIP: Use a white gel pen to add highlights to your colored image. A fantastic card Susan! Love the colours! 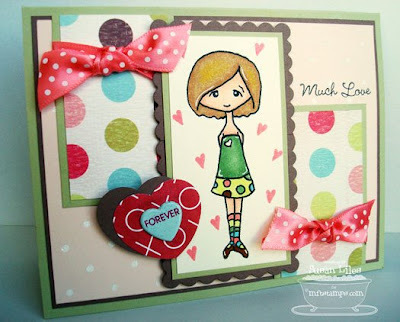 She's as sweet as can be and I love the polka dots! Can't wait to peek in to see what you've got in store for us with new releases! Suzie - I really enjoy your Q-Tips! They are so helpful....keep em coming and Happy New Year! Such colorful cuteness, Sus! I love her! Sweet, I'll say! Love what you've done with the sketch, and that cute l'il isabelle!